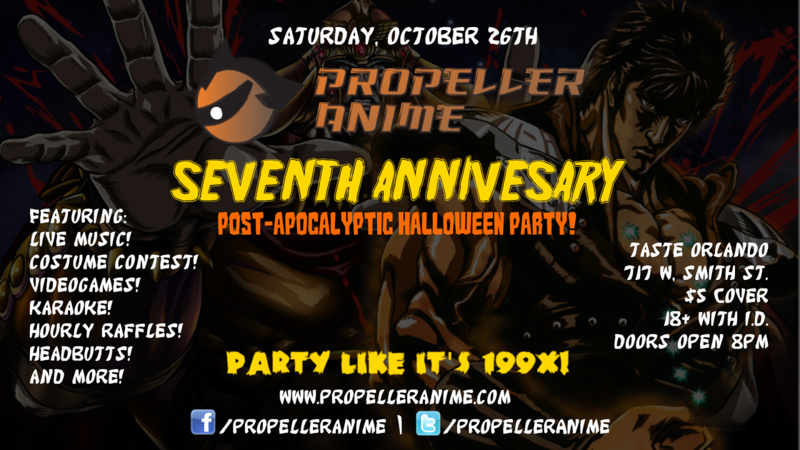 Propeller Anime: Big News For Our 7th Anniversary Halloween Party! Performers, Sponsors, Streetpass & More! Big News For Our 7th Anniversary Halloween Party! Performers, Sponsors, Streetpass & More! On October 26th, we celebrate seven years of fun times and being anime fans with the greatest otaku Halloween party of all time! We'll be at Taste and we'll have a night of live music, videogames, a costume contest, karaoke, hourly prize raffles, and more! We've been working really hard on making sure this party is awesome and here are all the new things to be excited about! Prize Sponsors & How To Win Stuff! We'll have prizes available for our costume contest and our hourly raffle! For the costume contest, the winners of our "Best in Show" and post-apocalyptic themed "Do Survive 199X" will receive plaques to commemorate the victory and convention passes! 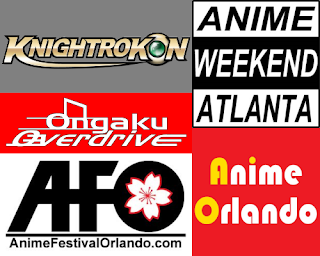 The winner of Do Survive 199X will receive passes to Anime Festival Orlando and Knightrokon, both taking place next summer. The winner of Best in Show will receive passes to Knightrokon and a convention we just attended and enjoyed: Anime Weekend Atlanta, with its 20th incarnation taking place September 26th-28th! If you are entering the costume contest, you need to be at the party and signed up by 9:30pm! There will be a prejudging session for each contestant so we can announce the winners after everyone has walked the stage! Your costume must be from an anime, manga, or videogame! Everyone who comes to our party will get a raffle ticket for our prize raffle and you can purchase more for additional chances to win! Each additional ticket costs $1 or you can get 6 for $5! Starting with 9pm, we'll have awesome prizes to give away to lucky winners every hour! Nerdcore Sampler and Dance Party! We wanted to make sure you got your money's worth and then some with our party and we're delivering! We'll have a lot of music inspired by anime and videogames performed live with our Nerdcore Sampler with 16-bit wizards MagiTek, robotic panda MC Wreckshin, and Pokérap master Shammers! 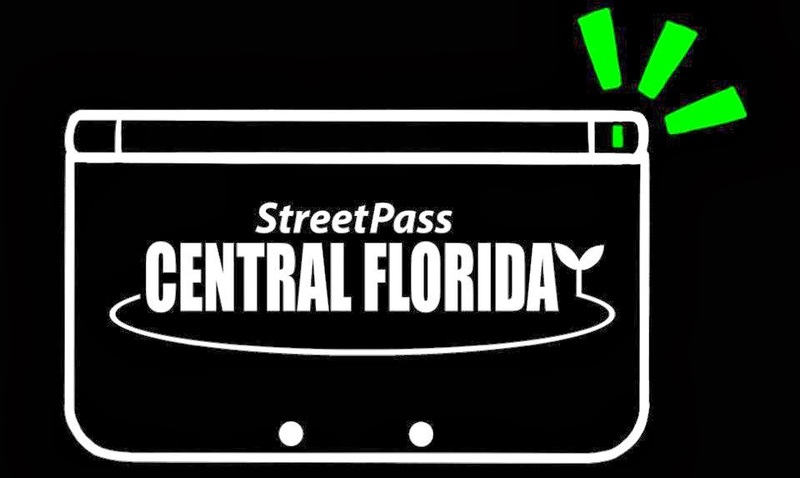 Streetpass Central Florida and Videogame Tournaments! 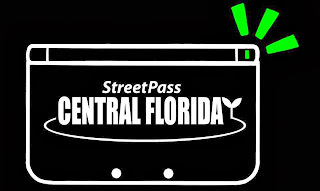 We are excited to announce that Streetpass Central Florida will be at our party! They have been doing a lot of awesome event in the community and they'll be hosting a Nintendo 3DS Streetpass meetup at our party! If you have a Nintendo 3DS, you should bring it! They will also be running videogame tournaments as well. In a future post, we'll have details about that but you might want to make sure that you have your newly caught pocket monsters trained well! Wow, that's a lot of stuff! October 26th is going to be awesome! Doors open at 8pm and you get all this and more for only $5! What an amazing value! We hope to see you as Propeller Anime grows a year older!